Gain knowledge and skills in choosing and implementing activities, apps and games that can be valuable tools for maximizing LSL, literacy and communication success. Describe specific LSL techniques and strategies when using the games and activities in therapy sessions and educational lessons. Become familiar with some current auditory (re)habilitation tools and resources which support LSL outcomes. You understand the principles of Listening and Spoken Language, now put them to work! 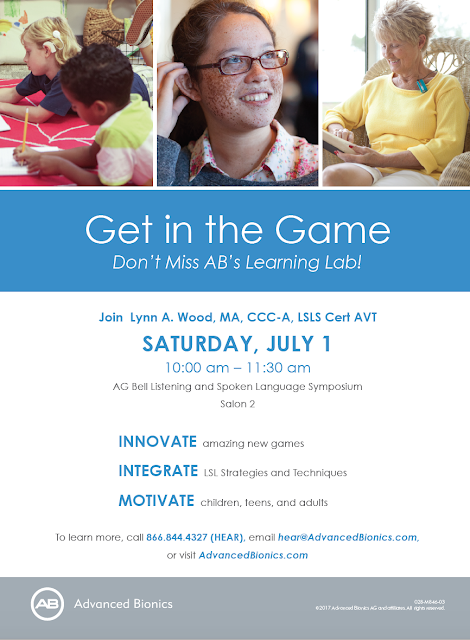 Learn fun, effective, hands-on LSL activities, games, apps and tools to sharpen auditory, language, literacy and communication success in children, teens and adults who are deaf or hard of hearing. Strategies, techniques and best practices for LSL will be incorporated throughout the session. Modeling LSL based games to be played at home with friends and family is a functional way to engage others in children, teen, and adult auditory learning, communication skills, and carryover. Motivating and valuable LSL materials promote confidence and communication success in hearing aids users and cochlear implant recipients throughout their hearing journey. Key recommendations and suggestions for engaging materials and tools for LSL sessions and lessons will be discussed. LSL resources and auditory rehabilitation tools commercially available that support listeners of all ages and stages will be highlighted and shared. Tools for LSL professionals, educational audiologists, hearing itinerants, speech and language pathologists, teachers, parents, caregivers, peers and for the individual who is deaf or hard of hearing will be explored. The format of this session will be interactive with demonstrations and audience participation.